Stick with the original. This piece of junk is just Disney's way of fleecing parents. With this week's theatrical release of "Return to Never Land" and the video release of "Cinderella 2" on February 26, Disney has blatantly abandoned any and all pretense of making cartoons for love, for art or for the entertainment of children. Flimsy, forced, fabricated sequels to beloved classics are about one thing: money. Disney has been doing straight-to-video sequels for years, but until recently the studio has had the decency not to desecrate its more timeless pictures. Now it seems anything is fair game -- even stories that end with the clear and definitive summation that "they live happily ever after." 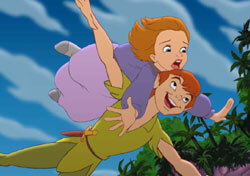 "Peter Pan" has a little looser finale and has, of course, been sequelized once before. But while Steven Spielberg was reverential, funny and wonderfully creative in the liberties he took in "Hook" -- starring Robin Williams as an stuffy adult Peter who rediscovers his inner child -- "Return to Never Land" is nothing but a recycling of the same tired themes Disney has beaten to death in nearly every animated feature they've released in the last 15 years. Opening during the Blitzkrieg on London during World War II, the cartoon introduces an adult Wendy and her deadly serious daughter Jane (the conspicuously un-childlike voice of Harriet Owen), who has become a very somber girl since her daddy went away to war. (Disney children are always short at least one parent.) She's too practical to believe any of the bedtime stories her mother tells about her adventures in Never Land -- that is until the night Captain Hook and his crew kidnap the girl as bait to lure Peter Pan into a trap. A one-liner spouting Pan (voice of Blayne Weaver) rescues Jane, who then goes through pretty much all the same Lost Boys rights of initiation that Wendy once did (being viewed as the boys' new mother, learning to fly and crow). In the course of one montage sequence -- set to the tune of a superficial, forgettable pop song -- Jane comes to believe in faith, trust and pixie dust, then helps defeat Hook and save Tinker Bell (who has been reduced to a one-note jealously joke sidekick). And that's pretty much all the cursory, uncalled for "Return to Never Land" has to offer. Minimal effort went into creating this movie, as evidenced by the unsophisticated animation and the lack of celebrity voices. Such things are not necessary to make a good animated film or even a good unauthorized sequel 'toon (see "The Tigger Movie"). But if Disney wants to bastardize classic children's stories by imagining what happened after their unequivocal endings, the least they could do is show a little ambition and imagination.